There is a Chinese saying that, before a housewife opens her front door in the morning, she should ensure her family has the 7 essential basic requirements for daily living: firewood, rice, oil, salt, fermented sauces, vinegar and tea. ‘Kai meng qi qian shi‘ (开门七件事) is the phrase, simply meaning ‘open door seven items’. I remember hearing the expression often when I was growing up in Singapore, though I’m not sure I understood why one needs these 7 items, let alone appreciated the underlying traditions and historical wisdom. Using their Chinese characters, the seven are, in order: firewood (柴 ‘cai‘), rice (米 ‘mi‘), oil (油 ‘you‘), salt (盐 ‘yan‘), fermented sauces or pastes (酱 ‘jiang‘), vinegar (醋 ‘chu‘), tea (茶 ‘cha‘). The first two give us the essential core energy or ‘qi’ without which nothing else is possible, even our very evolution as humans. The next two, oil and salt, give flavour to our lives. Then, once fed and warm, we need the help of friendly bacteria in fermented sauces and vinegar (items 5 and 6) to aid comfortable digestion, and finally tea takes care of us at another, social and potentially spiritual level. There’s a Chinese echo here of Abraham Maslow’s famous ‘hierarchy of needs’. In a series of blog posts I’m going to narrate what I find interesting about each of the 7 essential items for living, starting with the first in the list, ‘cai 柴’ or firewood. 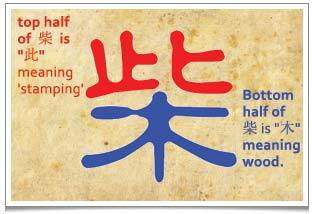 ‘Cai‘ 柴 (pronounced ‘chai’), the character for firewood comprises two characters fused together, the one for ‘stamping’ and the one for ‘wood’ (because you stamp on it with one foot while chopping it with your hands – hence, the ‘stamping’ character is on top). We Chinese are interested not only in cooking but in the inter-relationship of a given type of fuel, its burning properties and a particular food, and how that dictates a specific approach to cooking. We have so many have words that relate to methods of cooking. 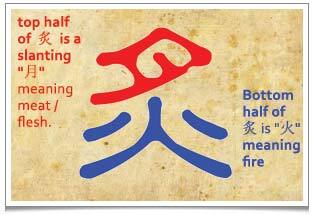 The character ‘zhi‘ 炙 (to toast or broil), for example, is graphically composed of the ‘meat’ 月 character hovering over the ‘fire’ 火 character. It describes a particular way of holding meat over a flame, at the edge of the main part of the flame (to be precise), that ensures the moisture is removed and the heat penetrates the meat and concentrates the meat’s flavour. 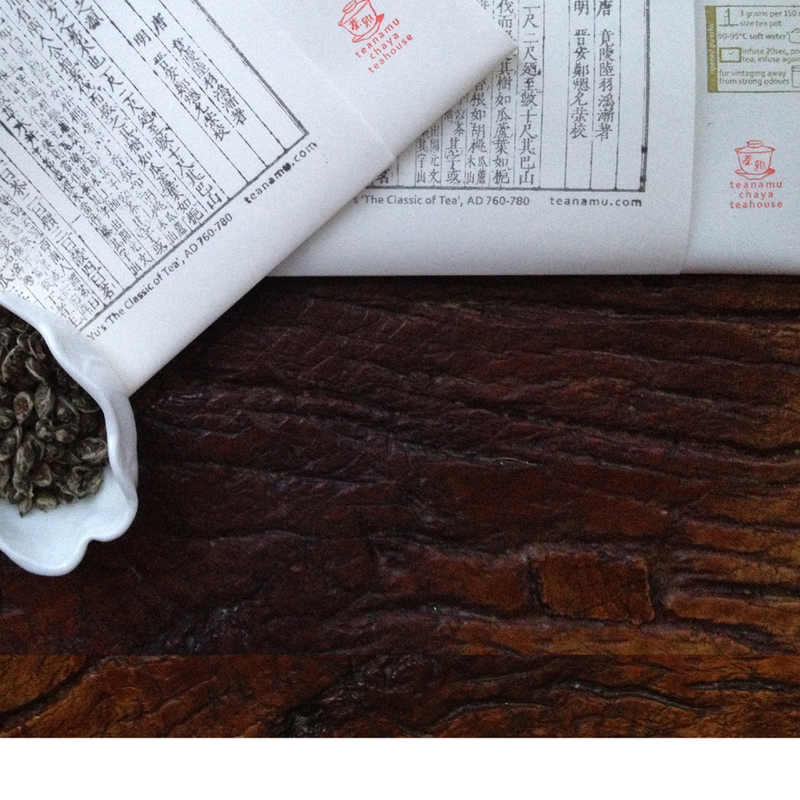 (‘Zhi‘ is also the method of toasting tea leaves described by Lu Yu in Chapter 5 of the ‘Cha Jing’). Many Chinese characters describe specific cooking techniques. The character for ‘zhi’ 炙 (a type of toasting) graphically depicts meat slanting over a fire. Tea is best brewed in water boiled over a fire of pine cones (actually, cooking over acorns or pine cones was traditionally an indication of wealth). Duck is roasted predominantly with wood from fruit trees, rabbit over peanut shells and chicken caked in salt or even mud (hence the famous dish Prosperity Chicken, also known as Beggar’s Chicken). The intense heat of wok stir-frying is designed mainly for cooking meat, but Traditional Chinese Medicine (TCM) regards this (including the typical metal stir-frying utensils) as fundamentally unhealthy, because we first consume the heat and passion intrinsic in the stir-fried meat, then add to it with the intensely hot cooking fire, and finally need to use up a lot of ‘qi’ core energy to restore balance and calm/cool ourselves. In Yunnan I once enjoyed a chicken steamed gently in a claypot that had a hole in its top rather like a Moroccan tagine. This kind of stewing or steaming is much approved of in TCM, as it doesn’t make us too ‘heated’ or lead to a waste of ‘qi’ energy. To reduce the ‘yang-ness’ of the chicken meat further, you can add shiitake mushrooms which grow in the dark and are therefore ‘yin’. The technique of ‘zhi’: a piece of tea cake is toasted on the edge of an open flame. Can you imagine the fragrance that permeates the air? 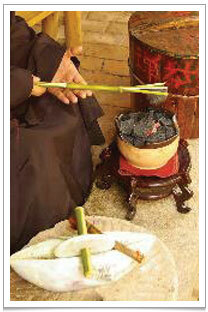 Aside from cooking, the main function of ‘cai’ is to provide warmth. TCM takes the task of warming the body very seriously. Unhealthy imbalances are caused by heating the exterior of our bodies, for example with typical dry radiator heat or electric heating, while leaving our insides in a cold, ‘yin’ state. A common sign of this is having cold hands and feet even in summer. The overly ‘yin’ effect is exacerbated when we freeze our insides with cold, often fizzy drinks requiring us to expend ‘qi’ energy to warm ourselves up (and expel gas). Insomnia is another sign, because it’s seen as stemming from having a hot or ‘yang’ head along with a cold, ‘yin’ condition in the rest of the body. Modern long-haul travel is of course unnatural. We flee to a hot climate in mid-winter, come back home and find our body is profoundly confused and tends to fall sick (I find this happens every February when I visit tropical Singapore for the Chinese New Year then return to chilly London). Eating tropical produce, when it’s freezing where we are, is equally unnatural and unhealthy. TCM tells us not only to dress appropriately (if you don’t dress warmly in winter you grow extra fat) but encourages a particular kind of acupuncture treatment, moxibustion, whereby heat is transmitted directly into our core using the herb mugwort (commonly known in this country as ‘moxa’ from the Japanese word ‘mogusa’). Mugwort or moxa produces a natural, human-friendly type of heat, similar to the winter sun or a mother’s bosom. At Chaya Teahouse we often use mugwort incense to cleanse the room and create a gentle warmth. Another substance that produces a similar heat is salt crystals, which you can wrap in a muslin cloth, heat gently and apply to any aching part of the body. A third way to heat the body is to soak your feet in cold water, and then gradually to add warmer water, until the soaking water is so warm that sweat appears on the tip of your nose. Underfloor water-based heating is similarly healthy (if you can afford it). In fact, in this vein, the better off Chinese, in ancient times, used a system of gentle, under-bed heating (they also made sure the young and vulnerable slept in the warmest part of the bed, the middle). To conclude, a gentle, not too dry or intense heat is considered best both for cooking and for heating. Poaching, stewing and steaming are therefore better than stir-frying, especially as meats are already ‘yang’ or full of heat by nature. Roasting may be done over a variety of fuels, and each has a specific effect. Traditional fuel materials like firewood and utensils like claypots are best, and dry heat or electric heat are undesirable. We are designed to live in sync with the seasons and with nature, so start now in small ways to make a few changes, and you will no doubt feel the benefits for a long time to come! An enlightening and interesting piece, thanks Pei. Hi, just read a great book on many of the Chinese accomplishments in the past. It’s called “1434 The Year a Magnificent Chinese Fleet Sailed To Italy and Ignited the Renaissance”, it is by Gavin Menzies. So interesting what happens with discoveries and inventions over time.